Feniton is a village and civil parish in East Devon the English county of Devon. 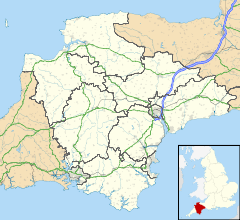 The village lies about 4 miles (6.4 km) west of Honiton, 3 miles (4.8 km) north of Ottery St Mary, and 2 miles (3.2 km) east of Talaton. The parish of Feniton incorporates the hamlets of Colesworthy, Higher Cheriton and Curscombe. It covers an area of 644 hectares (1591 acres), and is surrounded, clockwise from the north, by the parishes of Payhembury, Buckerell, Gittisham, Ottery St Mary and Talaton. At the 2001 census the parish had a population of 1,796, decreasing to 1,568 at the 2011 Census. The 2012 draft East Devon Local Plan recorded 716 houses within the Built Up Area Boundary. Feniton is a major part of the electoral ward called "Feniton and Buckerell". The total population of this ward at the 2011 census was 2,274. The original village of Feniton contains the 13th-century Church of St Andrew, the post office, and a number of thatched cottages. The Wesley chapel which was built in 1850 is now disused and functions as an animal store. The Vine Water, a tributary of the River Otter, runs through this part of the village and is generally believed to have given the village its name. Feniton new village lies about 0.75 miles (1.21 km) west of the original village and is separated by open countryside. This area was formerly known as Sidmouth Junction and for many years consisted of just a few houses, a public house and a chapel, which were associated with the building and operation of the railway station of the same name. From the mid-1960s onwards, this area was transformed into Feniton new village by various medium-scale housing developments. These were accompanied by the building of Feniton Primary School, two village shops (one of which has since closed), and a playing field. In 1967, when the new village was taking shape, the original Sidmouth Junction railway station and its associated branch line were closed as part of the Beeching cuts. The station was reopened by British Rail in 1971 with the new name of Feniton. South Western Railway operate services from it to Exeter and London Waterloo. More recently, a sports and social club, private dental practice, hairdresser and fast food takeaway have opened in this part of the village. In 2008 a number of residents were forced to move into the upper storeys of their houses to escape rising flood waters, and the village suffered again in November 2012: the village has its own Flood Warden scheme, and Devon County Council has estimated the cost of a flood defence scheme as in the region of £1.6 million. Under East Devon District Council's draft Local Plan, the Council deemed that in the period up to 2026 it would be appropriate for Feniton to host another 35 houses. However, several developers have applied to build a large number of houses in and around the village. ^ "Feniton & Buckerell ward 2011". Retrieved 24 February 2015. ^ "Church of St Andrew". National Heritage List for England. English Heritage. Retrieved 15 July 2016. ^ "Wesley Chapel". National Heritage List for England. English Heritage. Retrieved 15 July 2016. ^ "Flood hit Feniton villagers angry at home build plans". BBC. Retrieved 15 July 2016. ^ "About". Feniton Primary School. Retrieved 15 July 2016. ^ "Sidmouth Junction". Disused Stations. Retrieved 15 July 2016. ^ "Flooding". Feniton Parish Council. Retrieved 15 July 2016. ^ "Water, water, everywhere ... here we go again!". Susie Bond. Retrieved 15 July 2016. ^ "Feniton Housing Development – Ottery Road (120 or 59 houses)- Dismissed at Appeal". CPRE. Retrieved 15 July 2016. Wikimedia Commons has media related to Feniton. This page was last edited on 8 April 2019, at 02:28 (UTC).